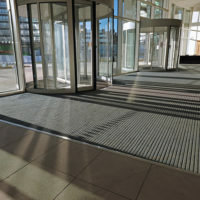 Discover the bespoke entrance matting system specified to protect internal floor finishes and keep dirt out of the BREEAM rated Co-Op Headquarters. 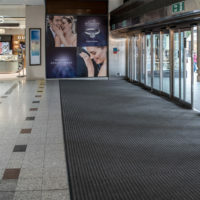 Concerned about slip accidents and potential floor surface damage the Bentall Centre needed a high performance shopping centre entrance matting system. Outside the main entrance to the park’s modern and highly sustainable ceremonial building, a bespoke entrance mat from Construction Specialties was installed. 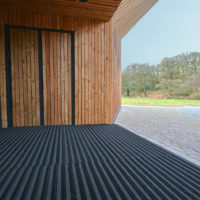 Entrance matting is an often overlooked building component, discover 6 surprising facts that will make you appreciate its importance in your building. BS 7953 recommends that entrance matting be a minimum of 2.1 metres but that's not always possible, so combining indoor & outdoor entrance matting is essential.